I recently heard myself ask the question, “How can I help?” It stuck in my mind because it’s not what I meant. The real question was “How may I serve?” Serving is different from helping. Helping is based on inequality. Helping is when we use our strengths to assist those of lesser strength. When we’re attentive to what's happening inside of us, we’re always helping someone who's not as strong as we are – someone needier than we are. Helping is valuable, but people feel the inequality. Serving accomplishes the same goal, but it’s a relationship between equals. Helping is based on a form of judgment. When we help a person we see as needy, we may inadvertently take away more than we give; we may reinforce their vulnerability and diminish their sense of worth. I saw this firsthand when doctors were helping my elderly but competent dad by talking to him as if he was a child. They would have served him better by treating him as a peer. When we help it’s easy to expect gratitude and pay back. I helped a friend balance her checkbook the other day. I didn’t want to help and I didn’t have time to help. She was insistent. Solving her problem included a modicum of satisfaction on my part at her relief, but she learned no skills, and you better believe she owes me! Serving is mutual. There is no debt. We are as gratified as the person we are serving. One winter I tore my Achilles tendon and hobbled through the snowy streets of New York on crutches. Crossing each slippery intersection in the limited time a green light allows, was exhausting and challenging. I felt inadequate and vulnerable. I hesitated at one four-lane crossing. Suddenly strong arms lifted me (and the crutches) in the air and across the intersection. It was amazing! When I was deposited on the far curb, I thanked the person for helping me. He flashed a genuine smile and said, “My pleasure to be of service! I remember the feeling of being on crutches!” Hmmm. I believed him. We both felt warmed by his awesome gift of service. 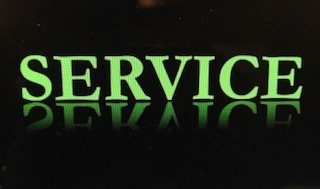 Service is a relationship between equals. We serve with our whole selves. We draw from all of our experiences: our limitations serve; our wounds serve; our strengths serve; and even our dark times can serve. The wholeness in us serves the wholeness in others. The bottom line is that we can serve without fixing or helping. The actions look similar if we're watching from the outside, but the outcome is different and the inner experience is different. Helping is draining and depleting. Over time we burn out. Being of service, serves us as well as others. When we serve, the act itself sustains us. Mother Teresa said, “We serve life not because it is broken but because it is precious.” Help and service are different ways of seeing life. When you help you see life as weak, and broken. When you serve, you see life as whole. From the service perspective, we are all connected. The impulse to serve emerges naturally and inevitably from this way of being. From time to time we all need help. Isn’t it wonderful when it comes as a gift of service?